Instant Pot Chili: This is the ultimate pressure cooker chili recipe! A classic beef and bean chili made in the instant pot, speeds up the cooking process and results in a super rich and hearty chili. 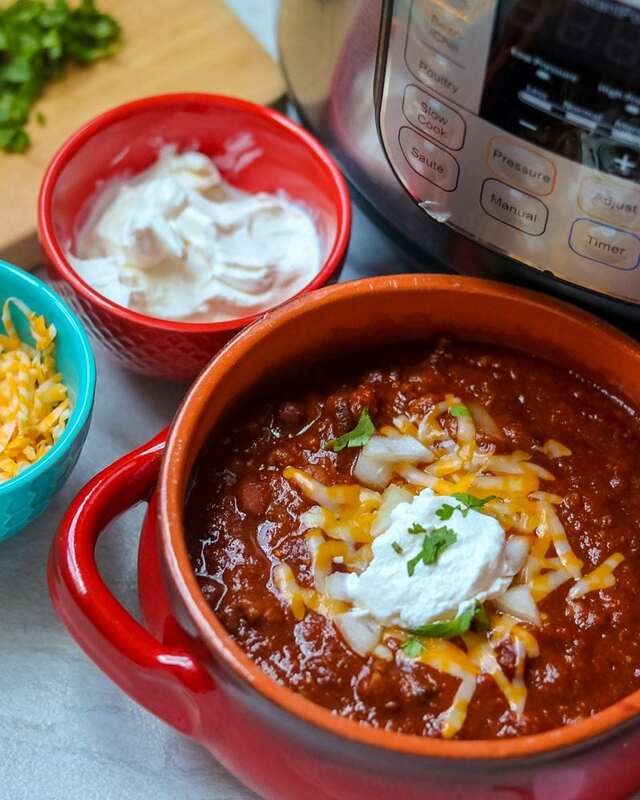 Your family will be begging for you to make this easy instant pot chili recipe again and again! I love White Chicken Chili, Lentil Chili, Chicken Chili and Black Bean Chili. But the one chili I have not shared with you yet, is my family’s classic chili recipe. And I apologize for waiting so long–this is an easy chili recipe you don’t want to miss! My mom would make chili at least every other week when I was growing up. My entire family of six loved my mom’s bean and beef chili and she loved that she could cook it in the morning and let it simmer all day until dinner. She also loved that Chili was meal hearty enough to feed my hard working father–at over 6 feet and working 12 hour days doing manual labor, that man was hungry at the end of a long day! The difference in my chili from my mom’s chili recipe is that instead of making it on the stove top, I make it in the pressure cooker. So while it tastes like it has been simmering all day, it is ready in about an hour from the minute you start prep to the minute you ladle up the chili to serve. While I have shared with you how to make Instant Pot Chicken Chili with Dried beans, this recipe for Instant Pot Beef and Bean Chili is different–and not just because it is made with ground beef instead of chicken. This Instant Pot chili is simple and classic in flavors–it is thick and hearty and just perfection. Turn your instant pot to the saute function and allow it to heat up. Brown your ground meat with the diced onions. Add in your liquid and scrape up the browned bits off the inner pot. This step is REALLY important–if you leave too many browned bits on the inner pot, your pressure cooker may not come to pressure correctly. Turn off saute function once meat is browned. Cook on high pressure for 35 minutes for dried beans. If you want super tender beans without much chew, add up to 10 more minutes of cook time. Let pressure release naturally–about 15 minutes. Can I use Turkey instead of Beef for Instant Pot Chili? Absolutely, you can make this Instant Pot Turkey Chili! In fact, you could use ground pork or ground chicken in place of the ground beef if you like. In fact, I have made this with ground bison, for a lean and delicious chili. Can I use Frozen Ground Meat for this Chili Recipe? YES, you can make this Classic Chili with frozen ground beef! I recommend, following my instructions for cooking frozen ground beef in your instant pot. Then crumble that meat up, place back into instant pot with remaining ingredients for the chili and cook on high for cook time. However, if you are really in a bind, you can place your frozen beef right into your chili and the meat will cook as the chili cooks. I will warn you that your chili may be greasy if you use this method and you will still have to break up your beef into this chili once it has cooked–so this is my absolute LEAST favorite way to prepare Instant Pot Chili. Can I use Canned Beans or Dried Beans for Pressure Cooker Chili? One of my favorite things about pressure cooking is the fact that I can cook dried beans in NO time. I use my instant pot to make beans and even cook chickpeas for hummus with no presoaking required. It is such a time saver. For red beans, black beans, pinto beans and kidney beans, you would use 2 cups dried beans in this Instant Pot Chili recipe. Be sure your beans are not old, if they are–they will NEVER get soft. When you are cooking with presoaked beans, the cook time is less. Decrease cook time to 25 minutes. Measure the beans AFTER soaking and use 4 cups soaked beans. You will not need a full 2 cups additional liquid if using presoaked beans, I would use 1/2 cup beer and 1 cup beef stock instead of a full cup of both. If you have canned beans on hand, you can easily use them in place of the dried beans in this chili recipe. You will need to decrease the liquid and the cooking time to 15 minutes. Use 4 cans drained and rinsed beans. You will not need a full 2 cups additional liquid if using canned beans, I would use 1/2 cup beer and 1/2 cup beef stock instead of a full cup of both. Is this Instant Pot Chili Recipe Freezer Friendly? In my opinion, leftover chili is better then freshly made chili. And since chili lasts safely in the fridge for 3-4 days, my family will eat this chili over baked potatoes or sweet potatoes for lunch during the week, so we rarely have leftovers to freeze. However, it is very smart to freeze this chili for future quick meals. I need to take my own advice! Allow chili to cool completely. Place in freezer safe containers or freezer safe bags, being sure to leave at least 1/2 cup space for chili to expand while frozen. You have a couple options to reheat frozen chili. Thaw overnight in fridge and reheat on stove or in microwave until warmed through. Remove frozen chili (frozen as solid brick) and place into oven safe glass container that fits into your instant pot. Place trivet in instant pot and pour in 1 cup water. Place bowl with frozen chili in instant pot and cook on high for 25 minutes. Do you Have to use the Chili Function on the Instant Pot to Cook Chili? As I have shared in my Instant Pot 101 and Instant Pot Functions, the functions on your instant pot are set as guides–your pressure cooker has no way of knowing if you used dried beans, canned beans or frozen meat. I RARELY use any of these functions, but instead default to cooking on high pressure and manually adjusting with the manual or pressure cook button on a pressure cooker. This chili recipe uses crushed tomatoes instead of diced tomatoes or tomato sauce. The reason for this is that tomato sauce will make the chili more watered down, since no liquid is evaporated in pressure cooking. I also prefer the rich flavor of the crushed tomatoes over the diced tomatoes–not to mention my kids prefer the texture! Crushed tomatoes is not liquid enough for pressure cooker chili. You need at least 1 cup additional liquid. I like to use beer for a rich flavor, but beef stock or chicken stock is a great substitute. Even a dry red wine would work. I would not recommend water, but it can be used in a pinch. If you like thinner chili, use more stock or beer–up to 2 cups total. If you like thicker chili, do not decrease the liquid, as that is needed for pressure cooking. Instead once your chili has cooked and pressure has been released, remove the lid and turn your instant pot back to saute and allow to boil for a few minutes to thicken up, as some of the liquid evaporates. Remember if using canned beans, you will need less liquid. I would use 1/2 cup beer and 1/2 cup beef stock instead of a full cup of both. I personally do not care for diced peppers in my basic chili, however if you like peppers, feel free to add them to the chili along with the onions. If you don’t care for onions or do not have any on hand, use 2 teaspoons onion powder and add along with the chili seasoning blend. If you want to add sweetness to your chili, add in one tablespoon honey. This will also help cut down on the acidity of the chili and is a great thing to add for anyone suffering from acid reflux. If you like really spicy chili, add in 1/2 teaspoon red pepper flakes OR 1-2 teaspoons hot sauce. Important Tip about Dried Beans: Be sure your beans are not old, if they are–they will NEVER get soft. Also, if you like really soft, tender beans, increase cook time to 45 minutes. A classic beef and bean chili made in the pressure cooker speeds up the cooking process and results in a super rich and hearty chili. 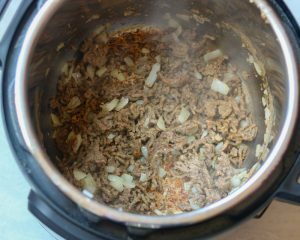 Turn your instant pot to the saute function and allow it to heat up until it reads "Hot"
Brown the ground meat with the diced onions, until just browned through--about 5 minutes. Add in your beer and stock and scrape up the browned bits off the inner pot. This step is REALLY important--if you leave too many browned bits on the inner pot, your pressure cooker may not come to pressure correctly. Turn off saute function. Add in the garlic, chili seasoning, and beans and stir well. Pour tomatoes on the top and place lid on instant pot with valve closed to "sealing." Let pressure release naturally--about 15-20 minutes. Remove lid and stir In Worcestershire sauce. If using canned beans or presoaked dried beans, decrease cooking time to 15 minutes. Remember if using canned beans, you will also need less liquid. I would use 1/2 cup beer and 1/2 cup beef stock instead of a full cup of both. In place of beer, feel free to use wine or beef/chicken stock. Be sure Worcestershire sauce is gluten-free if you need this chili to be gluten-free. Use black beans, kidney beans, or pinto beans in place of red beans--cook time remains the same. Oh my gosh, I love this chili SO much! It comes out so flavorful in the Instant Pot, too. Nom nom nom. YAY!!! Don’t you love how much flavor develops so quickly in the IP? Totally loving this instant pot chili! Great recipe!! Yay! Thanks for sharing your success Jenn! Hi – It says this. above…”For red beans, black beans, pinto beans and kidney beans, you would use 1 cup dried beans in this Instant Pot Chili recipe.” but the recipe calls for 2 ups of beans? It should say 2 cups per any variety of beans. Great catch, fixing now. Can this recipe be made without beans? If so, does that affect the cook time? You can absolutely make this recipe with more meat and less beans, just cook for 15 minutes. Question: what size instant pot was this made in? I have an instant pot mini duo! Hi I have never cooked with dried beans before and was just wondering if these need to be washed before putting them in the instant pot? I do recommend washing beans before cooking. Just place in colander and rinse well. Occasionally you will find a rock or two–VERY rarely! Enjoy! Hi Barb, yes you can double this recipe. The cook time will remain the same, but it will take longer to come to pressure and depressurize. Enjoy! So damn good and so damn easy. With barely any cleanup! This is definitely going to become one of our standby recipes. I love hearing that Gwen! I have an 8qt. Instant pot. Can I safely double this recipe? How would I adjust the cook time? Hi Holly, yes you can double this recipe. Cook time will remain the same, but the time it takes to come to pressure will be longer. Enjoy. I made it tonight. The BEST chili we’ve ever had. It turned out perfect! As others have stated, the flavors came together like it had been cooking all day long. Amazing! Thank you! Thank you Holly! I love hearing that. Hi! I just made this exactly as described — 30 mins on high pressure. My beans were not fully cooked. Did anyone else have this problem? I used 1 cup beer 1 cup broth and 2 cups black beans in the recipe. Hi Maya! If your beans were not cooked through, you can place lid on pressure cooker and cook for additional 5-10 minutes. It won’t take as long to come to pressure the 2nd time. I have never had this issue, using any type of bean, but it may be you didn’t let pressure release naturally enough or you like your beans falling apart..not with a bit of chew. Sorry for the hassle. I have a Crock Pot version of the IP and the kidney beans were not done after 45 minutes (30 and then 15) on the beans/Chili setting. Hi Marla! I am sorry the beans were not done for you. I personally have not used this brand of pressure cooker, but it should be similar cook times. In the future, use HIGH pressure (not beans function) and cook for 45 minutes and be sure to do a full natural release–that should help. You are so welcome Sherri! I hope you enjoy the Chili! Hi! I made the recipe as follows and added two cans of beans and cooked it for 15 minutes. The recipe was super watery. Is it supposed to be? Or did I do something wrong? Hi Maria! Yes, I mentioned if using canned beans you will need less liquid (dried beans absorb some of the liquid as they cook.) I added that tip to the actual recipe card now so others won’t miss it. You can salvage your chili by turning the saute function on the instant pot and letting the chili boil with the lid off to evaporate some of the excess liquid if you desire. I want to say that I have been cooking, serving and enjoying beans of various kinds for 57 years, & only recently learned from my best friend – a Colombian ‘bean expert,’ that if you are cooking your dry beans an adequate amount of time, and they aren’t becoming tender, it’s because they are old –past their prime. Thank you for that information–very helpful! Hi, IP newbie here and not a very organized cook. I tried the chili recipe and left it on saute until I was ready to set the pressure level. It was a good 20 minutes since I browned the beef and got everything in there. The result was heavy and mushy. The flavor was great!! Should I have turned off saute after browning? Hi Dianne, I am so sorry about your experience. Yes, you should have turned off saute after meat was browned, that will make a huge difference in consistency and texture. I hate you missed that step, I added in actual step (not just post) to clarify for anyone else. What type of beer would you suggest? Hi, are the dried beans soaked? If they are soaked are they measured dry or after soaking? Hi Shirley! I have directions for both soaked and un-soaked dried beans. For dried un-soaked beans, you use 2 cups. For pre-soaked beans, use 4-5 cups and 1/2 cup less liquid. The cook time will also be cut to 25 minutes for pre-soaked beans. Everyone in my house appears to be going on a low carb Keto diet kick. So I have no choice but to make this chili in our instant pot without beans. I plan to use 2 lbs ground beef and use a red wine as part of the liquid measurement. Do I keep the same amount of liquid (2 cups) as noted in the recipe if I am not using beans but add more meat?..and this sure sounds like it will be Scrumpdillyicious on our snowy night tonight. Thanks for the recipe…. Hi Clem! I would decrease the liquid to 1 cup for this recipe. I personally love red wine in chili, so that plus beef broth will be delicious! Stay warm and enjoy! Well here’s the scoop..with the 2 lbs of ground beef (and no beans)it still needed a bit more liquid than 1 cup (so I added and went generous on the wine of course) and if you don’t mind I tweaked it a bit with by going heavier on the Chili Powder and Cumin and adding some Rotel, cocoa, Oregano and smoked paprika….. MMMMMmmmm is all I can say. WAHOO!!! So glad you enjoyed!!!! I cooked for the 35 min. 10 min natural release. beans still way too hard. I am pressure cooking it another 10 minutes. I hope that will do the trick otherwise it is smelling great. I added more beef stock for it looked too thick. Hi Heidi! If your dried beans are a bit older they can take a bit of time to cook through. And it was a good idea to add stock after a quick release of a thick stew/chili like this before trying to cook longer or you may get a burn notice. However, you may need to add in a bit more seasoning, as the stock will dilute the flavor a bit. I hope you enjoy! I’d love to try this with tomato puree instead of canned tomatoes. Any suggestion on changes I’d need to make? Cooking time or liquid measurement? I would add in 1 cup extra liquid, but cook time will remain the same. Hey Kristen, so happy I stumbled upon your site ! My IP is still boxed up but with your recipes/tips I’m feeling motivated and have the confidence that I can do it. Question: my kids pick out the onions and bell peppers so I usually sauté and blend them up in my vita mix to a mushy consistency. Do you think I need to adjust the beer or broth because of this ? Thanks!